Eddie Dean greets 2012 announcing, "Happy New Year everyone! Since it is now January 2012, that means Tommy Fest 10 is Just around the corner. Order your tickets now and be sure to bring your friends." 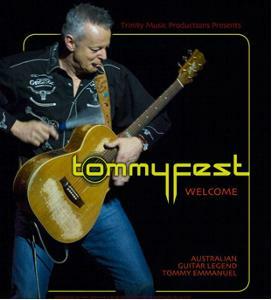 Tommy Fest 10 starring Australian Guitar Legend Tommy Emmanuel will be held at the Hardin County Schools Performing Arts Center in Elizabethtown, Kentucky on February 2 through 5 for three nights of concerts and two guitar workshops.